Find the best External Hard Disks at the lowest prices from a wide range of ORICO products available at TodayOnIndia.com. Also check our best selling ORICO products ORICO 2588US3 Tool USB 3.0 External Hard Drive Enc..., ORICO 3.5 inch USB3.0 External Hard Drive Enclosur..., ORICO 2. 5/3. 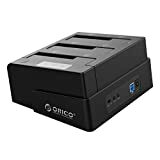 5 inch HDD and SSD Hard Drive Dock, ORICO 6629US3-C USB3.0 to SATA3.0 Dual Bay Externa..., ORICO PHP-35 3.5 inch HDD Protector Anti-Static Ha..., Orico Carrying Case Pouch for External 2.5-inch Ha..., ORICO 2 Bay SATA to USB3.0 External Hard Drive Doc..., ORICO 2.5 & 3.5 inch SATA2.0 USB3.0 1 to 3 Clone E..., ORICO 3-Bay USB 3.0 Duplicator Dock to 2.5 inch/3...., 5 Bays 3.5 inch HDD SSD SATA Hard Drive Protection... and more.